The scorecards were at the ready. Tech pundits were poised to poke fun. All were waiting to grade Qualcomm CEO Paul Jacobs’s performance as the CES keynote speaker on Monday evening. It’s the first year since Microsoft, the longstanding headliner and keynote company, pulled out of the conference entirely. And then Steve Ballmer showed up. The Microsoft CEO couldn’t stay away from the evening’s big event, after leading the charge for the past 12 years. About 20 minutes into the event, Jacobs brought Ballmer onstage to talk about all the “cool stuff” Microsoft is doing, running on Qualcomm’s chipsets. But despite being onstage for only about five minutes, Ballmer stole the show. It turned into a pitch for Microsoft, as the CEO showed off a slew of smartphones running Windows Phone software and the latest tablets running Windows 8. Sure, Qualcomm debuted some new chip lines and touted a few videos with a cutesy CGI dragon. But that took a back seat to Ballmer hawking his Windows gear. Too bad for Qualcomm it didn’t play out that way. 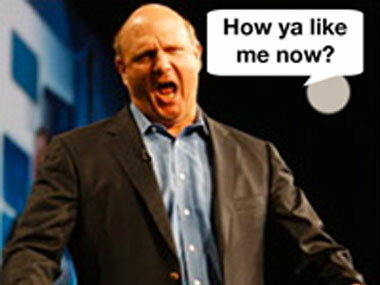 Even in a post-Microsoft CES, Ballmer still owned the night.